Little Jewel (translated by Penny Hueston, review copy courtesy of the publisher) begins with a chance encounter on a Metro platform in Paris. A young woman, the narrator of the piece, sees an older woman in a yellow coat, one who looks very much like her mother. Despite the resemblance the narrator can’t quite bring herself to approach the woman, mainly because her mother supposedly died in Morocco years earlier. Having followed the woman in the yellow coat to her home, the young woman tries to decide if she should take the final step, unsure as to whether she even wants to make contact with her mother. Instead, she gives herself a little time to think it over, and as she goes about her usual business, little things remind her of her past, memories flooding back of days spent with (and waiting for) her mother. Very soon, you wonder whether the poor woman will cope with the sudden weight of her unfortunate past. 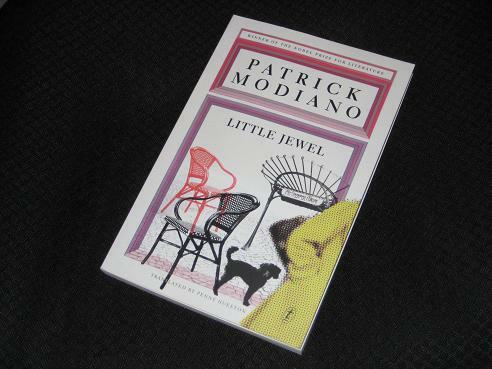 Little Jewel is certainly not a long book (despite clocking in at 158 pages, it could easily have been less than a hundred with smaller type and less generous spacing…), but it’s a nice introduction to Modiano’s work. The story is concerned less with what happens than with how the young woman feels about the surprise encounter. Young Thérèse (whose name we only learn towards the end of the book) is a soul adrift, floating from job to job, with no friends or family. It’s easy to see why the sudden appearance of the woman in the yellow coat disturbs her so much, throwing up the possibility of the return of her mother. The mother is a woman whose image is slowly constructed in her absence, the reader (through Thérèse) receiving glimpses of a bohemian lifestyle. We infer days of men, dancing and neglect, even if the true woman remains frustratingly vague and absent. In some ways, Little Jewel is a fairly simple book. The language, for example is mostly straight-forward (I imagine Modiano would be a good suggestion for those wanting to try reading novels in French), and there’s nothing complex here in terms of plot. There’s a lot more to the book than that, though, with Thérèse drawing us through the Parisian streets in her company as she visits metro stations, bars and cafés. We get the odd glimpse of daylight, but for the most part, this is a book of darkness, with the narrator preferring the early morning or night. The darkness is also metaphorical, with each memory dragging the young woman further into a murky past, one which might end up affecting her future. The one Modiano I read (Search Warrant) was also very much concerned with memory and the past. It was a powerful work, but I found when I picked up a second volume of his that it seemed so similar I put it straight down again. I suspect I’ll return to his work again but I think reading too many titles close together could be a problem. Stu – There’s certainly been a flurry of activity in recent months (more so than for some other previous Nobel laureates). I would like to try some of his more famous earlier work soon, though. I’m planning to get a few from the library, they’ll be in French, since there are no copies of his work in the English section, but the novella form is ideal for reading in French. I was interested to come across Modiano in Antoine Laurain’s light hearted novel The Red Notebook and I thought Laurain’s work could even be a reference to his book Dora Bruder (The Search Warrant), another I am keen to read. I wondered about the timing of his cameo appearance in the novel, but the publisher confirmed that it was a coincidence, Laurain’s book was written before Modiano went on to win the Nobel prize. His other translated novel The President’s Hat is also a tribute to another personality, François Mitterand. Both great, light reads. I found out about him when I recently visited the Nobel Museum in Stockholm, and I bought a copy of ‘Missing Person’. From your review, and the comments above, it seems his plots are very similar. It’s good to know that his works are increasingly available in English but I’ll wait a while before reading him again. This is a good introduction to Modiano (it was my first book by him), as it’s got very simple language and the story is relatively straightforward and moving. I think you are quite right, that his books may be a little too similar, so one needs a gap between. I would have liked L’Herbe des Nuits for instance to take things a little further, but it doesn’t quite – there’s a certain stasis in his style. His memoir was very touching, and perhaps helps to explain his shyness and lack of confidence (as well as his obsession with memory and family).